Reuters/Darren StaplesPrime Minister David Cameron. Prime Minister David Cameron was at the Confederation of British Industry’s (CBI’s) annual conference on Monday to deliver one simple message: the UK is OK. Unfortunately, his platform is losing him friends and alienating business. In his opening remarks, CBI president Sir Mike Rake outlined the three issues most concerning his members in the run-up to next year’s general election. First, the UK’s membership of a reformed European Union is overwhelmingly in our national interest. Eight out of 10 CBI members, large and small, would vote to stay in the EU in a referendum. Second, 63% of CBI members say that immigration has been beneficial to their businesses; only 1% say it has been negative. The economic evidence shows that immigration is of net benefit. Finally, falling real wages — a price worth paying to preserve jobs during and after the recession — cannot go on for much longer. Taken together these points form something of a business manifesto for the major political parties to compete to meet. Yet on all of those three points, the Conservative Party is moving in the opposite direction. 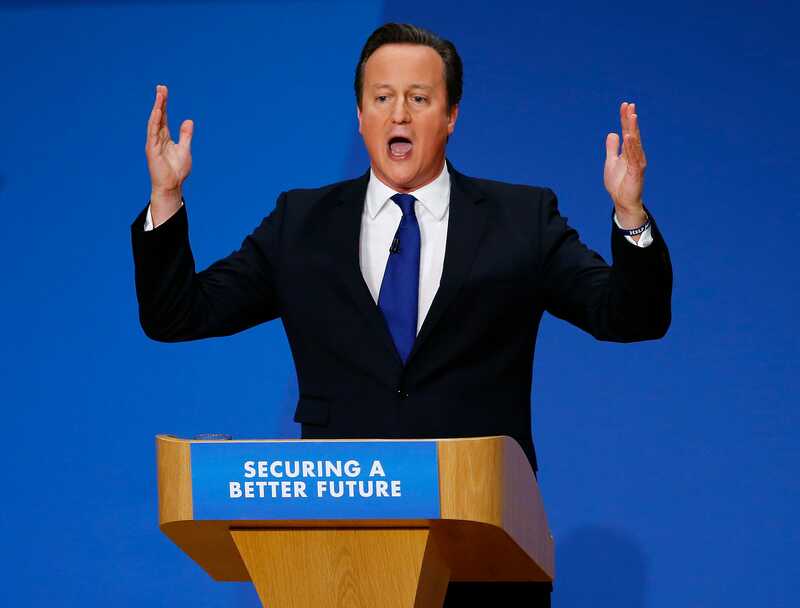 Cameron’s speech seemed to ignore all of the demands of a traditionally Tory-friendly business community. Right now, there is increased concern over the possibility of losing access to European markets — due to Cameron’s pledge to hold a referendum on EU membership in the next parliament — as well as losing access to skilled migrants because of populist immigration controls. The Prime Minister stressed the need “to do more to control immigration, both outside the European Union and inside the European Union”, despite European leaders warning that tighter immigration controls would risk the UK’s membership of the economic bloc. 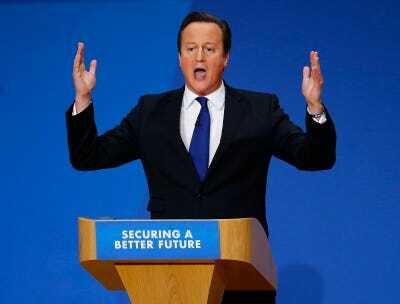 Moreover, he claimed that the EU referendum wouldn’t harm the country’s nascent economic recovery. Yet this “job well done” narrative grated against the general theme of what needs to be done to fix the country’s low wage growth economy. If the Conservatives were looking to win over business leaders with a well-targeted speech, this wasn’t it. The CBI’s message was clear that business leaders are concerned about Tory policy on Europe and the impact of falling real wages. After all, it is their members that see economic uncertainty and falling wages impact their profit margins and, ultimately, put a drag on broader activity. In response, Labour leader Ed Miliband said that an EU exit would be “a betrayal of our national interest and a clear and present danger to businesses”. He called the UK’s economic rally a “payless recovery” warning that “millions of people believe that this country is not working for them”. The overriding message is that Britain is in the process of recovering from its economic ailments but it is far from healthy yet. The CBI are advising giving the patient a dose of tax cuts for low-paid families and a reduction in childcare costs to treat the symptoms, alongside long-term treatment of investment in building workforce skills in order to improve competitiveness and productivity. Although there was a pointed question asked about his support for a return of the 50 pence higher rate of income tax and his support for a mansion tax, Labour’s “cost of living crisis” narrative was clearly much closer to the CBI’s diagnosis. The Tories, meanwhile, may as well have been prescribing a course of leeches to cure a headache. Given that the Tories traditionally view themselves as the party of business and enterprise signs that they may have positioned themselves on the wrong side of major issues will be a significant cause for concern in the lead up to the general election. Memories of 1997, where Labour took the enterprise vote from under their noses on the way to a landslide victory, will be fresh in Conservative Party strategists’ minds.